Also known as the Sebile or GT knot, it connects the leader to the main line. It could be braid to a mono or fluorocarbon leader. It is popular with sport fishing skippers in Australia mainly and all over the world. It might seem difficult at first, but with practice, you can do it quite easily and fast, in just about 30 seconds to be precise. That should be reason enough for it being your go-to leader knot. It is a good alternative to expensive wind on leaders. It has emerged a winner is most strength tests with knots for the same purpose. Though there are multiple ways to tie, many of which have been touted tough, we choose to stick with one of the simpler versions popularized by Captain Jason Ehrlich of Australian. 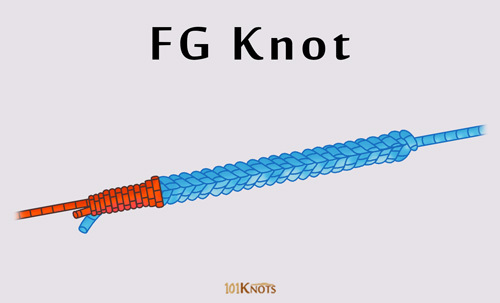 The FG (full form fine grip) knot was originally designed by GT fishermen who found their line to line connections giving way due to the hard fighting giant fish. They also wanted something that could easily pass through the guides since they were mainly casting poppers and swim baits. The key to successful tying is to maintain tension on the lines. It is important to do the tightening at the designated steps to lock the coils in place. Otherwise, the knot may slip and fail. It is not recommended to put super glue on the knot as it tends to crack when it is under pressure. That can create sharp edges compromising the line. Moreover, the junction loses pliability. It can get weak if you make mistakes in tying. It is better to learn to tie this knot than relying on swivels that can weaken the fragile main line and damage rod guides. It also takes more time to tie 2 knots to a swivel than tying a single line to line knot. PR bobbin knot – Is tied with a bobbin. Doesn’t hold on well to mono to mono connections either. Using a Rizzuto finish instead of the half hitches might be helpful. Uni to uni or double uni knot – Thicker and lower breaking strength. Better for mono to fluoro connections. Alberto (modified Albright) knot – Weaker and thicker. Albright knot – Weaker and thicker. Bimini twist – When combined with the double uni, Yucatan and Albright knots, it was found to be weaker than the FG knot. However, on coupling with the FG itself, it is found to be stronger. Improved Albright knot – Thicker, weaker. Slim beauty knot – Weaker and tougher to tie, mostly in low light conditions. Larger. Necessary for anglers who cast or jig for big and powerful game fish like tuna, GT (giant trevally), etc. With shock leaders for surfcasting. 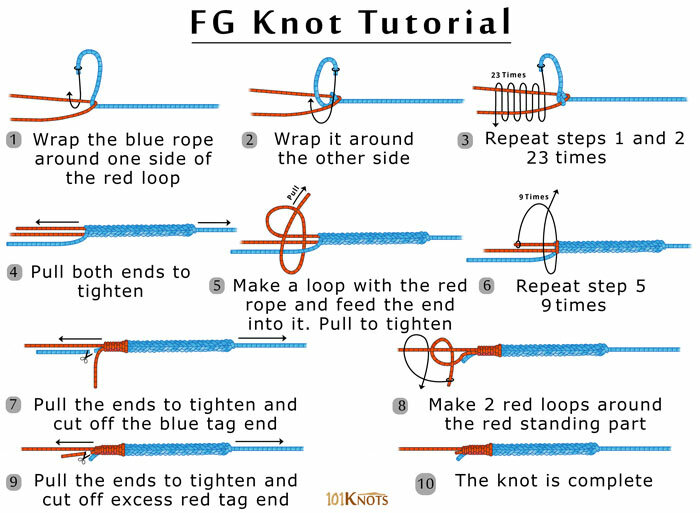 The video at https://youtu.be/pjzUb5QRKuk does NOT appear to be the FG knot as depicted in the FG Knot tutorial! The video knot results in a bunch of coils of braid around a single piece of the mono, while the FG Knot tutorial clearly shows the coils of braid going around a doubled up piece of mono, which locks in the braid. I have tied the knot using the video and I have had it come off the end of the mono so the tutorial knot version would seem to be superior. Of course it would also be twice as thick. Is the video a modified version of the FG?? Please explain. Thanks! Sorry for the inconvenience. You can follow the tutorial diagram itself. The video is of a modified shortcut version that might not be the best option at all times. It was added to our article due to a lack of availability of proper video tutorials on Youtube and other popular sites. This one seemed to be the closest to our diagram.